GoHz multi-function solid state (static) frequency converter is a standard AC power supply electronic device, it can simulate international standard power supplies, convert fixed AC voltage and frequency power into stable pure sine wave power by internal AC to DC, DC to AC current rectifying, with high activation current, and displays a number of parameters (Such as: voltage, frequency, current, apparent power, power factor etc. ), to make home appliances, electric machines etc working at their rated frequency. Besides of adjustable frequency, the internal isolated transformers of the solid state frequency converter also allow user to adjust output voltage. GoHz solid state frequency converters adopt advanced PWM (Pulse Width Modulation) technology with compact size, light weight and high efficiency features. 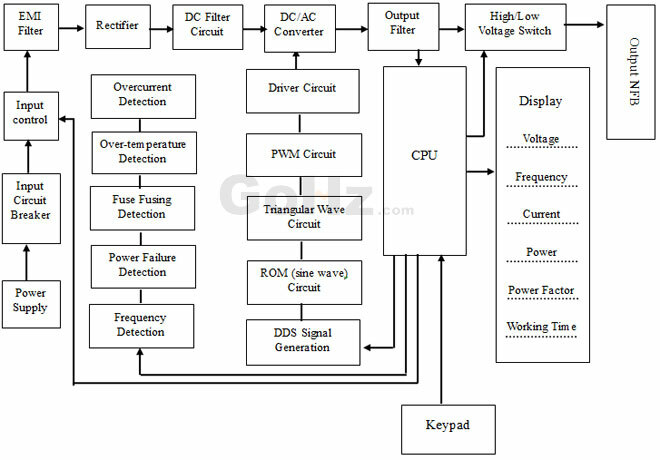 Digital Signal Processor (DSP) technology provides high precision measurements function of voltage, frequency, current, apparent power and power factor etc. The use of high power IGBT module in this solid state frequency converter is designed to reduce circuit complexity, enhance frequency converter operation stability and reduce power consumption. And the isolation transformers completely isolate the mains and the loads, in order to improve the loads stability and a variety of testing performance, to ensure the accuracy of test values for the loads. 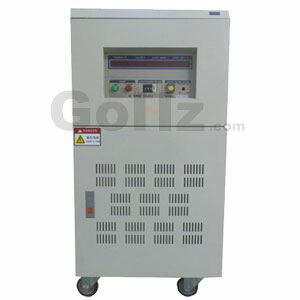 GoHz solid state frequency converter provides wide range output voltage (0 - 300V for single phase converter, 0 - 520V for three phase converter) and frequency (standard 40Hz - 120Hz, 120Hz to 499.9Hz is optional), suitable for general home appliances, commercial electrical and electronic machines.